For all but seven months of the first eleven years of their marriage, James Hunnewell was living in the Pacific, Susannah was in Charlestown, Massachusetts. On January 7, 1822, a small group gathered to print the first work from the press, “Lesson in Owhyhee syllables.” Kalaimoku (Kalanimōku,) a Hawaiian who had learned the alphabet, was given the honor of striking the first impression off the press, after which Loomis printed the second and Hunnewell the third. It is a sheet four by six inches, headed “Lesson I,” beneath which are twelve lines, each having five separate syllables of two letters. This was certainly the first printing at the Hawaiian Islands, and probably the first on the shores, of the North Pacific Ocean. Kekela, born at Mokuleʻia, Waialua, Oʻahu was a beneficiary of Hunnewell’s generosity – Kekela attended and graduated from the Lahainaluna Seminary, at the expense of Hunnewell. In recognition of his great obligation to his benefactor, he adopted his name and was ever known as James Kekela. Later, Kekela saved an American in the Marquesas; President Abraham Lincoln learned of the dramatic circumstances of the rescue and had presented a total of 10-gifts to the rescuers. While there were several other participants, this story really relates to two people – James Kekela and Jonathan Whalon … and because of the meeting between these two, President Abraham Lincoln stepped into the picture. James Kekela was born in 1824 at Mokuleia, in Waialua. After public schooling, he was selected as a promising candidate to attend the mission school at Lahainaluna. Mr. Kekela was the first Native Hawaiian to be ordained as a minister in Hawaiʻi, ordained at Kahuku on December 21, 1849 and settled as pastor of the Hauʻula church. He served as pastor for two or three years until he was called to foreign missionary work – in 1853, the Hawaiian churches decided to unite to support a mission to the Marquesas Islands, sending out missionaries from among their own ranks. Rev. James Kekela and Rev. Samuel Kauwealoha, and their wives, were accompanied by New England missionary Benjamin Parker of Kāneʻohe Mission Station; these native couples were the first Hawaiian families to serve as missionaries in the Marquesas, 1853-1909. They settled on the island of Hiva-Oa in Puamau, a large valley with 500 inhabitants – the valley rises two miles inland, where it terminates in an abrupt precipice 2,000 feet high. Kekela’s counterpart in this story, Jonathan Whalon, was born at Dartmouth, Massachusetts, in 1822. On July 13, 1841, he applied for and was granted Seaman’s Protection Certificate #58 at Fall River, Massachusetts. He served on whaling ships and made a total of seven whaling voyages, working his way up the chain of command, from green-hand to captain on his fifth and sixth voyages. His seventh and final voyage (in 1864) was on board the whaling ship Congress 2, as first mate. Evidently everything went smoothly until he decided to visit the natives on the island of Hiva-Oa. Unbeknownst to all, previously, a Peruvian vessel had stolen men from Hiva-Oa, and the Marquesans were waiting for an opportunity to revenge the deed. Mr. Whalon went on shore to trade for pigs, fowls, etc, and the natives, under the presence of hunting pigs, decoyed him into the woods, where, at a concerted signal, large numbers of men had been collected. Mr. Whalon was seized, bound, stripped of his clothing, and taken to be cooked and eaten. The dramatic circumstances of Jonathan Whalon’s capture and rescue were reported when his ship reached America, and the incident eventually came to the attention of President Abraham Lincoln. Although the President was engrossed in the ‘War Between the States,’ he was so moved that he sent $500 in gold to Dr. McBride, US Minister resident in Honolulu, for the purchase of suitable gifts that would express his gratitude to those who had participated in the rescue. Unfortunately, President Lincoln never received the thank you note; Lincoln was assassinated shortly before the note’s arrival. After forty-seven years of foreign missionary service in the Marquesas, Rev. and Mrs. Kekela returned to their native islands. Kekela died in 1904. He is buried in Mission Houses cemetery a few steps from where his gold watch and letters are kept at the Hawaiian Mission Houses Historic Site and Archives. 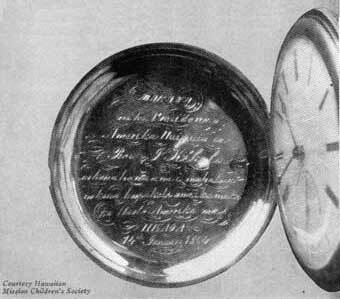 The image shows the Kekela watch and inscription (in Hawaiian.) In addition, I have added other images in a folder of like name in the Photos section on my Facebook and Google+ pages.